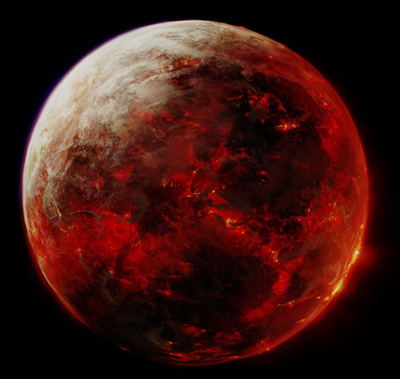 Mustafar is the second planet in the Mustafar system. Located in the Outer Rim, the tiny planet of Mustafar is a fiery world where lava is mined like a precious natural resource. Its bleak landscape is a visual assault of jagged obsidian mountains with towering fountains of fire and lava blasting from beneath the surface. This lava also streaks the blasted landscape in huge winding rivers and plunging cataracts. Mustafar's skies are obscured by choking black clouds of ash, smoke and tephra. The intense geological activity creates natural scanning interference that has kept prying eyes away from Mustafar for most of its history. The young world of Mustafar is literally being torn in opposing directions, caught in a gravimetric tug of war that keeps it from becoming the moon of a nearby gas giant. Despite the close proximity of massive Jestefad, Mustafar keeps to its erratic orbit, pulled by the distant influence of another giant, Lefrani. The tidal strain heats up Mustafar's molten core, resulting in spectacular geological activity across the entire planet. After the destruction of the Separatist Council and the Imperialization of the Techno Union, Mustafar was largely forgotten. A Separatist stalwart, the fugitive Geonosian Gizor Dellso, holed up on Mustafar during the early days of the Galactic Empire and re-established an independent battle droid factory, requiring the attention of the loyal 501st legion of troopers to storm the hellish world.